S. Vakili, I. Steinbach, F. Varnik. Curvature evaluated using the proposed error cancellation scheme (red diamonds) and the standard approach (blue circles) for the case of a double well potential. The solid line shows the exact result for a radial phase field, reprenting a two dimensional disc of radius R=1. Within diffuse interface models for multiphase problems, the curvature of the phase boundary can be expressed as the difference of two terms, a Laplacian and a second, gradient, term of the diffuse interface variable, ø. In phase field simulations of microstructure evolution, the second term is often replaced by f’(ø) = df/dø, where f(ø) is the potential function in the free energy functional of the underlying physical model. We show here that this replacement systematically deteriorates the accuracy in local curvature evaluation as compared to a discretized evaluation of the second term. Analytic estimates reveal that the discretization errors in the Laplacian and in the second term have roughly the same spatial dependence across the interface, thus leading to a cancellation of errors in k. This is confirmed in a test case, where the discretization error can be determined via comparison to the exact solution. 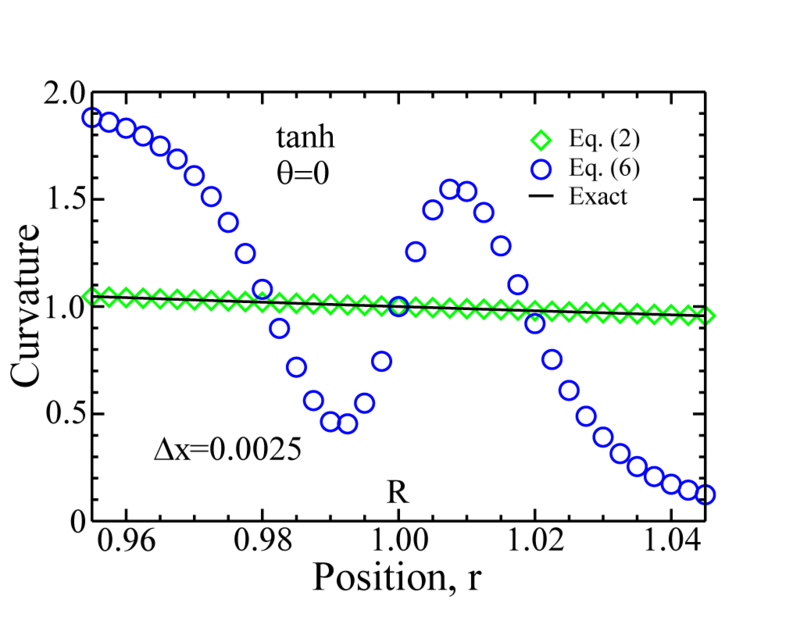 If, however, the second term is replaced by a quasi exact expression, the error in ∆ø enters k without being compensated and can obscure the behavior of the local curvature. Due to the antisymmetric variations of this error term, approaches using the average curvature, as obtained from an integral along the interface normal, are immune to this problem.